So excited to be featured in the Washington Post, NYTimes, and other newspapers that picked up this AP story! And also some great local press! Check out the Artblog review of my site specific installation at Glen Foerd on the Delaware. This piece is still up, if you haven’t had a chance to see it yet! The interactive app, Resistance: Philadelphia is now available for download on the Apple or Google app stores! 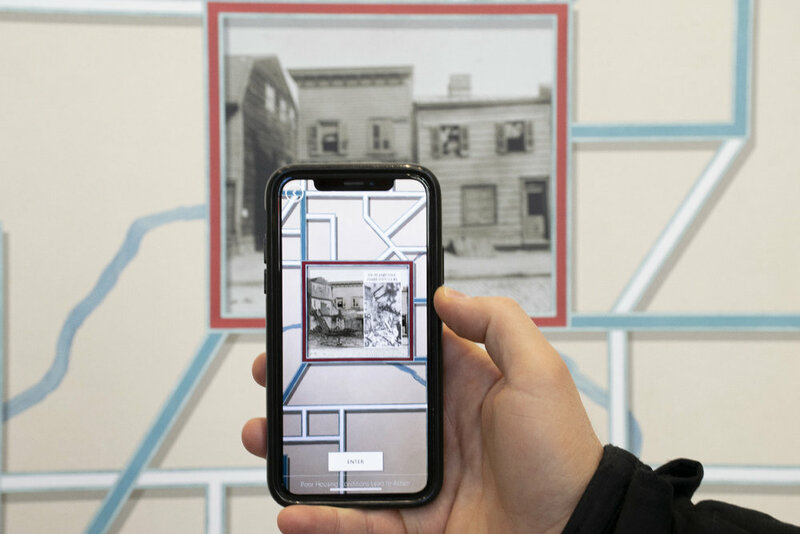 You can view the content for the app any time, but for the whole augmented reality experience you must visit the City Archives. Excited to be a part of this wonderful group of works all about swarming at the Moss Arts Center at Virginia Tech. Read about it in this article in the Roanoke Star or on the Moss Arts Center site. I was honored to share a space with these lovely ladies for Victoriana Reimagined this past summer! Thanks to Heather Moqtaderi-Gibson for putting on such a great show. The show closed in October, but if you missed the show, you can read about it in this great artblog review! Always honored to show with my fellow Grizzly Grizzly members! See larger images of my new paintings of scavenger birds and obsolete Macs under "ruins" and "Birds." Haven't shown these Honey Bees in a while! Come see them through June 30 at Crane Arts building! Group show opening this Thursday, June 8, 6-9pm. In The Sovereign Map, Christian Jacob writes that mapping “is a speculative process in which the graphic mechanism attests to the symbolic violence inherent in every model, that is, to the transformation of real space into a figure ruled by laws of reason and abstraction, of the conquering appropriation of reality by means of its simulacrum…. The map reconstructs the space it represents, organizing it and optimizing its legibility and visibility.” (Jacob, 23, 28) In the case of Manhattan, and a number of other cities in the U.S. including Philadelphia, the map was made before the city was there. A speculative process it was, indeed, and a projection that enacted the transformation of real space not only on the surface of the map but on the surface of the city’s terrain itself. In the Morris-Jumel Mansion, the oldest house on the island of Manhattan, Philadelphia-based artist Talia Greene’s site-specific installation Passage meditates on the development of the island, the erasure of species, and the camouflage of the natural site by the abstract and all-encompassing urban grid. Greene figures these developments as a literal violence – inciting extinction – and as the symbolic violence evoked by Jacob – the conquest of a space by laws of reason and abstraction. The mansion was built in 1765 when the area was all farmland and forest, and witnessed the encroachment of the grid as it moved north. Now, it functions as a museum with landscaped grounds and several carefully staged and closed-off period rooms – of the type that viewers can only peer into. Before taking a close look at Greene’s intervention in the house, I explored the rooms on the first floor. One, with windows overlooking the grounds, is robed in a brilliantly colored chinoiserie wallpaper of birds among flora and fauna. A Hudson River School landscape painting is given a central spot over a fireplace; juxtaposed with the wallpaper, it makes for an intriguing junction of representations of nature that resonates with what I have already gleaned of Greene’s installation. I later learn that the landscape is of a site in New Jersey, but its placement still evokes a sense of what pre-settlement Manhattan would have resembled, allowing visitors to project a pristine and idyllic scene onto the urban setting that surrounds them. Greene’s installation starts in the stairwell to the second floor. Taking her cue from the remarkable wallpapers that fill the house, she has papered the walls with a digitally printed mural painting. The mural starts as an abstract grid delineated by hatch marks; lacking descriptive details, one nevertheless recognizes it as a composite of street maps of Manhattan. As I climb the stairs, birds start to interrupt the grid – specifically, live and dead passenger pigeons, which, according to the explanatory texts, mostly vanished a few decades after the city grid reached the Morris-Jumel Mansion in the 1860s. Foliage grows back in, the grid breaks up, and other species populate the walls the higher I climb: red-tailed hawks, small frogs, leaves from the nearly-extinct American chestnut. Elements have been incorporated from details elsewhere in the house, such as birds that appeared in the magnificent chinoiserie pattern in the downstairs room. These features elaborate a dense web of references to the context of the site. In a bedchamber on the second level of the mansion, Passage continues with an installation of artificial leaves that Greene painstakingly laser-cut from a grape leaf pattern similar to the room’s own wallpaper. The leaves are draped and spread over the furnishings of what was once the room of the infamous Aaron Burr while he was briefly married to the matron of the house. Tendrils of leaves emerge out of the wallpaper and spread through the room, reclaiming the space and blurring its carefully contrived order. The label reads “In Aaron Burr’s room the ‘chaos of nature imposes itself on the space,’” yet it seems more fitting and more interesting to think of the installation as yet another layer of artifice. The leaf cutouts, painstakingly arranged over the room’s fussy furnishings, do not overpower but echo the constructed nature of the house and the urban landscape. Emerging out of the wallpaper they mimic, the endlessly-repeating leaf patterns pose a chain of imitation and establish a hereditary link to the 19th century notion of wallpaper explained in the wall texts of the house: apparently a common metaphor in 19th century literature, wallpaper stood in for ideas of falsity and concealment. The leaf installation might also be seen as a speculation on a building abandoned to the forces of nature rather than carefully preserved and constantly restaged for spectatorship. Whether a projection into the future, an alternative present, or retrospection on a past Manhattan governed by nature, Greene’s intervention highlights the oddity of historic preservation, which attempts to maintain human traces in defiance of time and in contempt of usefulness. Passage meditates on some of the localized effects of the anthropocene, inviting speculative passages into non-human temporalities. Greene’s exploration of the human impact on a site lays bare the competing logics of order, carefully contrived and persistently implemented, and the unavoidable entropy that issues most surprisingly from our very attempts to rule space “by laws of reason and abstraction.” The scope of the damage related to the climate crisis, which escalates beyond our ability to comprehend and certainly exceeds our powers of containment, speaks to this paradox. Greene referenced Eric Sanderson’s book Mannahatta: A Natural History of New York City throughout her research for this project, and on March 12, Sanderson will give a lecture at the Morris-Jumel House as part of the closing reception for this show. More details can be found here: http://www.morrisjumel.org/upcoming-events/2016/3/12/lecture-ecology-and-urbanity-the-past-present-and-future-of-manhattan-island. Love the drawings that kids at Arlington Arts Center made, inspired by my work! Opening for King of the Forest: Adventures in Bioperversity at Arlington Arts Center: Saturday, February 20, 6-9pm. Below, a group of kids discussing some of my work in the show at Arlington Art Center. I am thrilled that Eric Sanderson, author of Mannahatta: A Natural History of New York City will be speaking at the closing for my installation, Passage, at Morris Jumel Mansion. Stay tuned for details! I am pleased to be included in the group exhibition, King of the Forest: Adventures in Bioperversity explores and imagines the strength and severity of the impact that humans have on the planet, and particularly on animals. In this exhibition artists explore and imagine what our relationship to animals and to the planet could be in some future, dystopian version of the natural reality, and in some cases what that relationship already is in the present day. Artists will wrestle with these ideas with works that blur the line between human and animals, comment on the human-imposed and oft-flawed power structures and hierarchy of the natural world, and examine animal behavior to gain insight into our own actions.